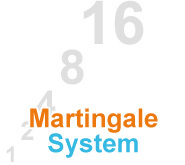 The Martingale system is possibly the most popular out of all betting systems, mostly due to it's simplicity and ease of implementing at the roulette table. However, just like every other betting system, it is flawed, and will not help you to win money in the long run from roulette. The basic idea behind the Martingale system is that you double your bet after every loss to recoup your losses and win one bet. After every win, you resort back to your standard betting amount. So for example, if you are betting $5 on an even money bet and lose, the system states that you should bet $10 on your next go. If you were to lose that $10, you would then bet $20. If the $20 wins, you have recouped your losses and won an extra $25 on top, and you can resort to betting $5 at a time like you did at the start. At first this system seems pretty okay, and you might be thinking “fair enough”. However, the major flaw in this particular system is that it requires you to have an infinitely sized bankroll, and there must be no limits to how much you can bet at the table. If there are limits on the amount you are able to bet, you will not be able to recoup your losses after extended losing streaks. Lets say you are playing roulette with $75, and you are betting $5 at a time. Using the Martingale system, you can only afford to encounter 4 losing spins before you lose your money, as you will have bet $5 + $10 + $20 + $40, which equals a total of $75. Therefore after the 4th spin, you are left with no money to bet with to try and recoup your losses and win money. On the other hand, lets say you are Bill Gates and you are drunk. You have an (almost) infinite amount of money to play with, but yet again decide to bet $5 each time on a table where the maximum bet is $200. This time it will take 5 losing spins ($5 + $10 + $20 + $40 + $80 + $160) before you are unable to bet a large enough amount ($320) to try and recoup your losses and come out a winner. So the casino ends up winning once again. Whilst a large number of losing spins is not going to be common, the fact of the matter is that it is going to happen eventually if you play for long enough. You can use the Martingale in almost any form of betting or gambling. You could use the system when playing blackjack, craps, coin tossing, anything. Some gamblers even use the Martingale system on slot machines. However, it doesn't matter which game you use it on – you're always going to lose. The worst thing about the Martingale system is that things can get pretty expensive quite quickly, and before you know it you could be laying down a substantial amount of money on the table. This is another reason as to why I really wouldn't recommend implementing the Martingale system (if the fact that it can't help you win wasn't enough!). If you want to bet for small stakes to see how the Martingale system works, then be my guest. You might have some fun with the system, but make sure that you are betting small so that you can keep a lid on the amount of money you are betting with as things start to escalate. Just be sure that you try not to use the system as a way to make money – it's not going to happen.